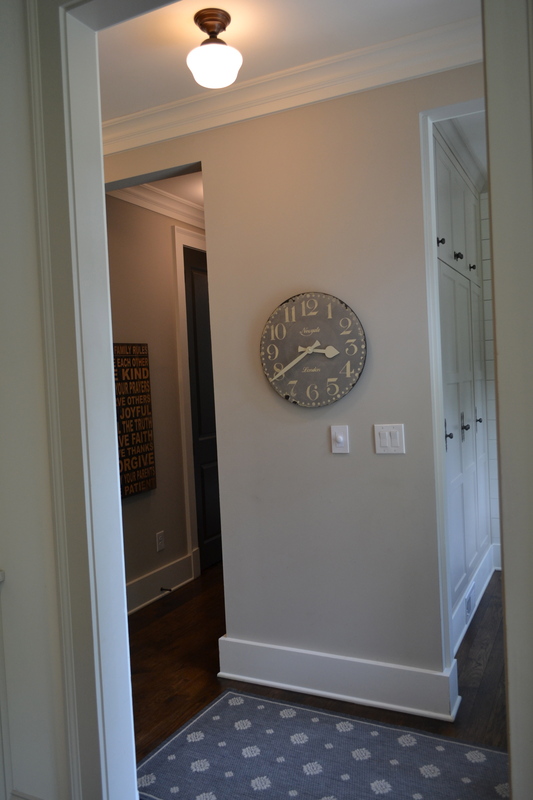 When we were constructing one of the additions, I wanted this one to feel like it WAS an addition and I decided to use shiplap on the walls to create that effect of having it look like it was added on at some point. 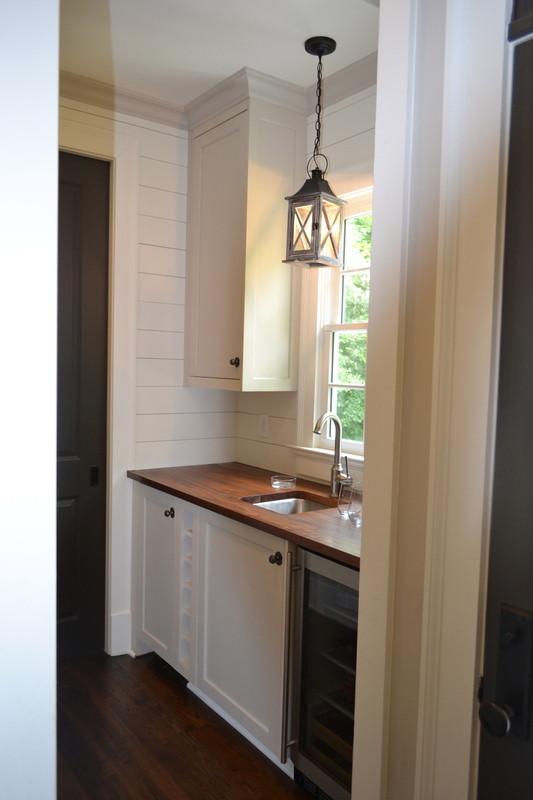 There are many ways to do shiplap. I prefer a more rustic look in both material and installation. Here is how we brought it to life. Take perfectly good walls and paint them black! Yes, black. You can purchase the cheapest paint you can find for this. Why black? Well, when you hang your boards, everything looks uniform because there is a black base underneath. By uniform, I do not mean straight or equal gaps. I mean it looks like it is supposed to be that way. I wanted it to look a bit rough and not perfect. My husband would tell you we had perfectly good walls and then I paid someone to hang grade 2 wood on them. That’s exactly what I did but with four kids, a dog and a cat, nothing wears better than shiplap on the walls. You cannot hurt it! You can ding it up and I will call it character. There are a couple of things that you need to do to make it hang correctly besides the black paint. You need proper baseboards. You need squared off base boards that stick out further than the shiplap will. You cannot install shiplap on a typical suburban baseboard or it won’t sit or look right. Same thing with any crown moulding you may have. It has to sit right beneath it or if you do not have any, you can add a piece on top of the shiplap to finish it off. Once the boards are all up, you use a brush and paint them. You cannot use a roller because the paint will not go on correctly. And there you have it! Ship-lap walls. We used #2 spruce on our walls. It is full on knots and character! 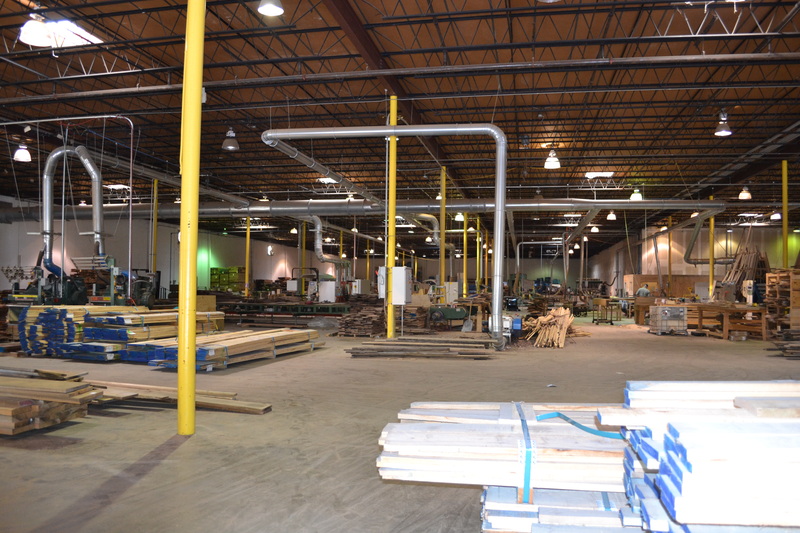 One of the additions we added was an entire back hall that houses many of the daily required family functions including our laundry room, kitchen office, pantry, lockers and a powder bathroom. 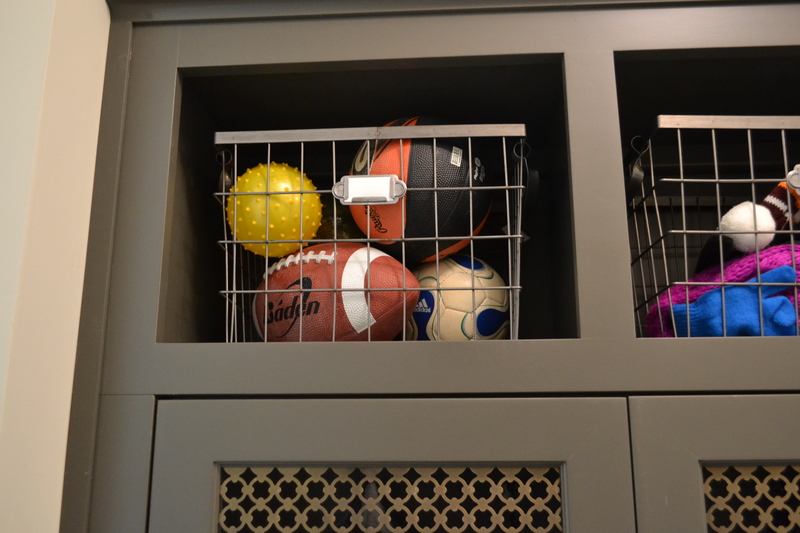 I’ll start with the lockers, which as a mother of 4 small kids is one of my favorite things in the house because it hides mess and anytime you can hide mess with kids, that’s a big deal! My main criteria for the lockers were that we needed one for each child and they had to have doors! When I was giving our architect my criteria he looked up and told me- ‘Melanie, everyone knows you have kids.’ My response to him was- ‘but they don’t have to see proof with every inch of the house!’. So, we went with doors. The screen/mesh material for the cabinet doors was one of my best “finds”. 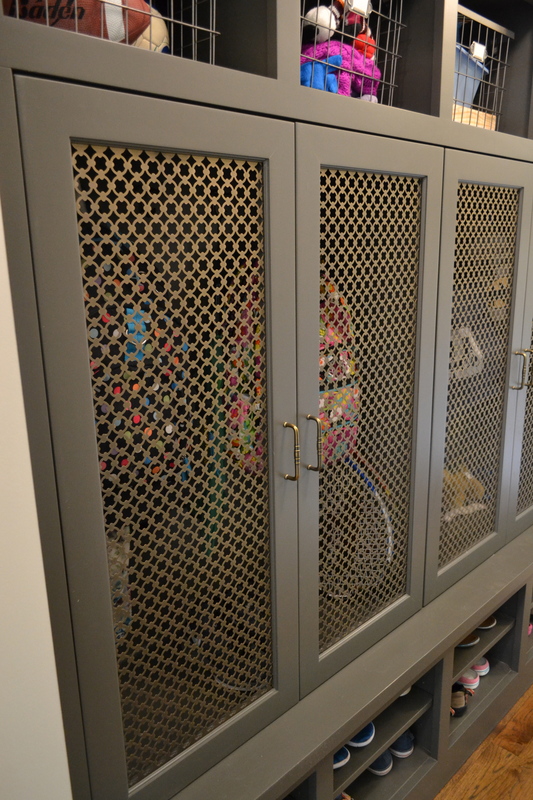 It is difficult to find cabinet mesh other than chicken wire and it can get very pricey quickly. I was lucky enough when using Houzz to come upon a photo that sourced the wire inserts on a picture I liked. They came from http://www.brass-grilles-shop.co.uk/- Brass Grilles UK Online Shop. They are completely online- you place your order with the correct measurements and they ship it to you. Shipping was very reasonable and their product selection is so dynamic, I love these guys. I never spoke with anyone over there, I did everything via email and submission on their website. I highly recommend them. They sent the individual sheets directly to me and I handed them over to my cabinet maker. The most unbelievable thing is they came FedEX Overnight! I didn’t know they were delivered and I wasn’t looking for them because I figured it would take a few weeks to receive them and one day I checked my order status online and it said it had been delivered weeks ago! I panicked and raced to the house to find them tucked away in the garage! The metal inserts do a great job of hiding the “stuff” and the wire bins I found at the Container Store recently to keep the upper nooks organized. We have way too many shoes. You enter the back hall from the kitchen. This is the view from the kitchen and on the other side of the wall behind the lockers to the right of the clock pictured here is our pantry. We did not have the space for a large walk-in pantry. This layout actually works quite well because I have a lot of shelving, some pullout shelves and plenty of room to garb it up with snacks and dry goods. I use the upper cabinets for storing things we do not use that often. 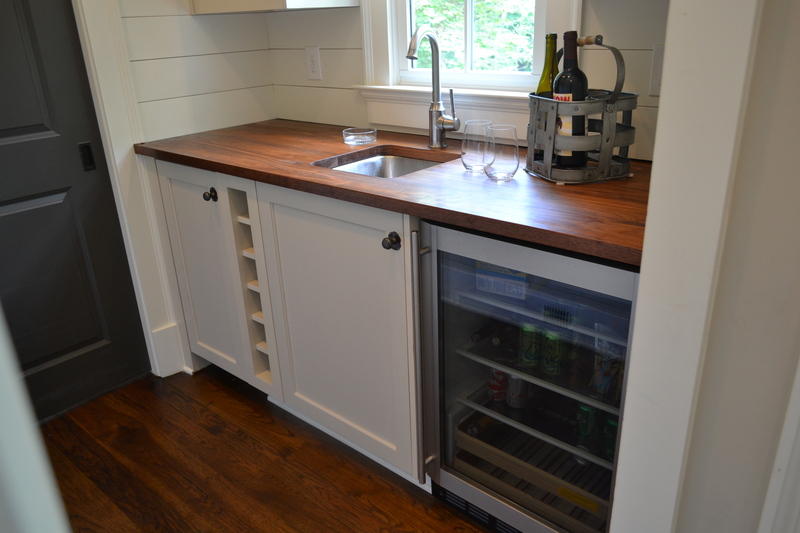 Opposite of the pantry is a little beverage station(I can’t stand the term “wet bar”) that houses wine, a beverage refrigerator and an ice maker. It’s right by our backdoor which I love because we can run in to grab a drink or ice. The walls are covered in shiplap. That’s what we call it because I have seen several names for the wood boards people use on their walls. 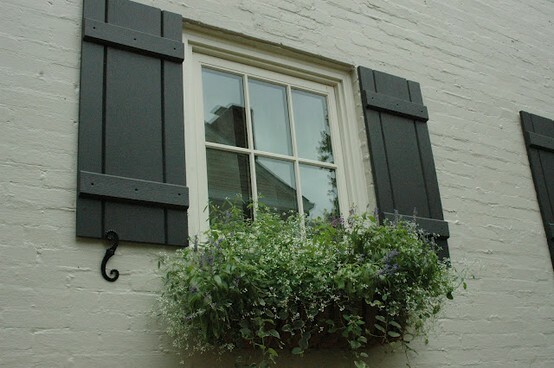 Ours is spruce and painted the same color as our trim. It creates a farmhouse type of look and we used it in most of our back hall. It is great for hiding handprints! 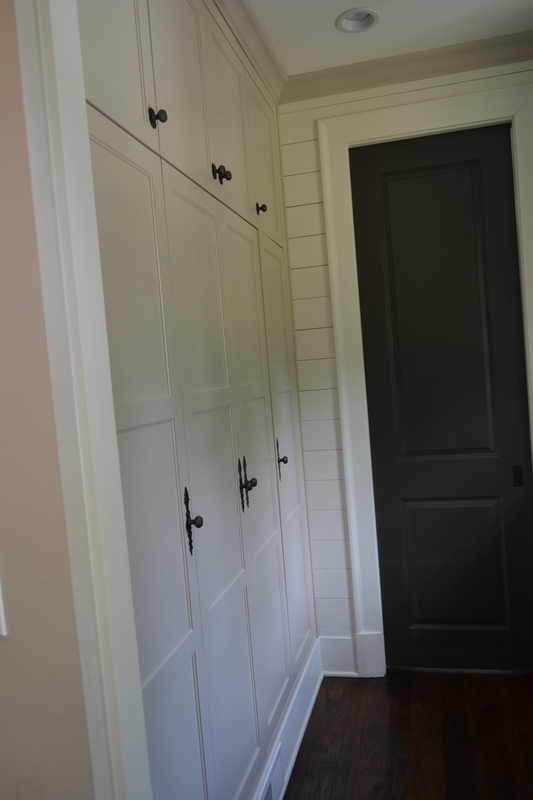 We added pocket doors between both the lockers and the pantry area to the rest of the back hall to be able to hide our laundry and kitchen office if and when we have guests over. All of our doors on the main floor are painted dark. 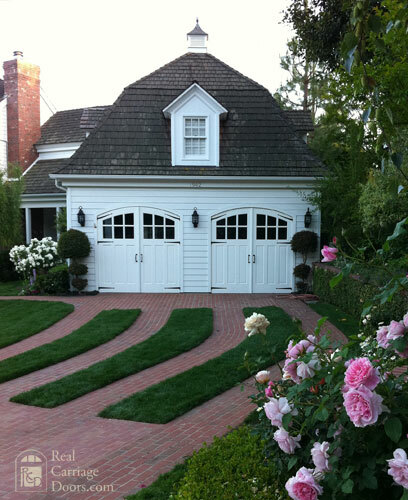 It totally makes the look of the house and I love it! Great for hiding hand prints too! The lantern is from Shades of Light. I ordered a few lights from there and they all worked and are in the house but the only thing that was disappointing with them is when you place your order, they do not tell you if your item is in stock. The first thing I ordered it turned out was on backorder for weeks. It was very upsetting to find out after your order that you can’t get what you wanted! I called and they gave me a discount off the purchase so that made me feel better and I just waited for the item to arrive. The countertop is walnut and the sink is a hammered nickel. The whole thing does what we need it to and works well for both wine and juice boxes! What more can you ask for? Where to begin. Well, we have to paint it at some point and I am googling everything to do with “Exterior Paint” combinations under the sun. There are so many shades of white I quit counting and I do not have a degree in design so I do not understand undertones so there you go. The colors are pretty, they look sophisticated to me and they are clean-looking. I like this look. 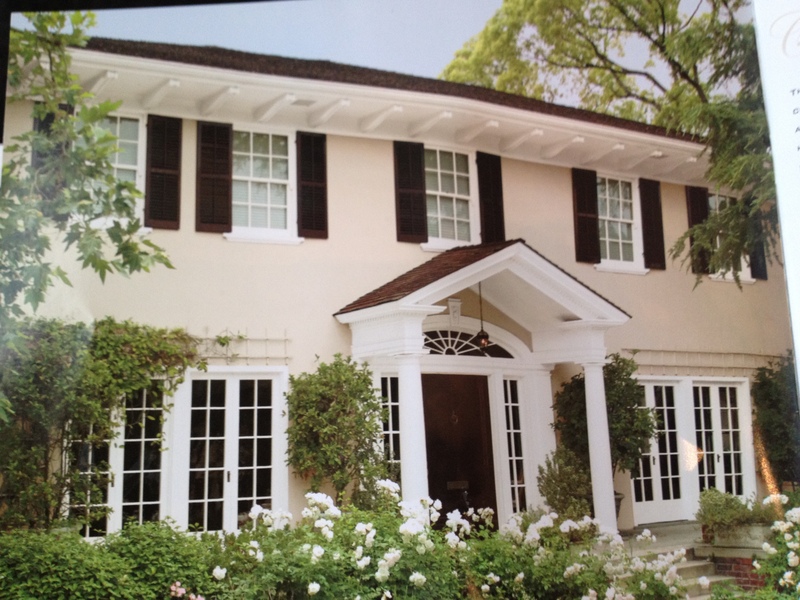 Pretty, I think…kind of a beige with a dark brown shutter and crisp trim. Love the green landscape with it. This looks like our house but I wonder if it is too yellow…hmmmm. I have the magazine advertisement from Behr with this picture and it looks better in person that online. I just love white. I could sure tear up that pretty grass driveway with my Suburban though! Wouldn’t stand a chance! I’ve called in for reinforcements already. I have a consult next Wednesday with a paint specialist. Then I can have someone else to blame if it doesn’t turn out okay! Today was fun. 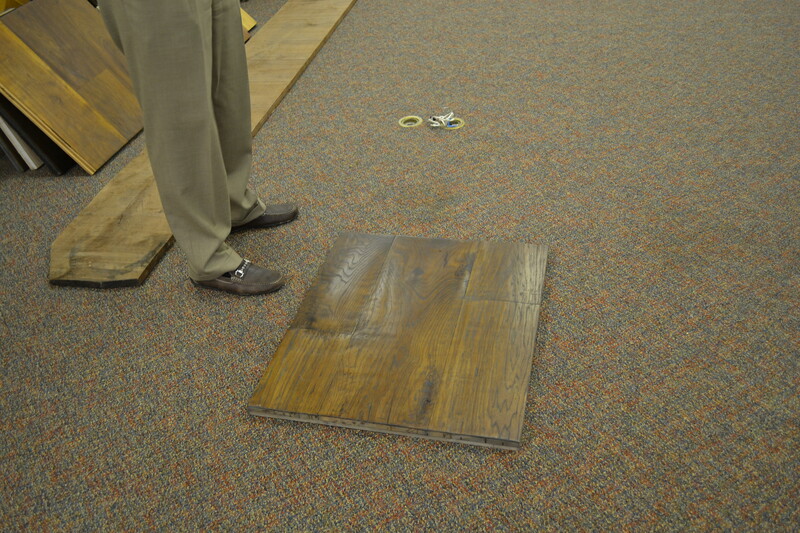 We had the privilege of going to see the inter-workings of Olde Savannah Flooring. William(Bill) Riley gave us a tour today of their facilities and it was nothing short of spectacular. A few weeks ago, going through my files of torn out magazine pictures, I stumbled upon an ad from Olde Savannah Flooring that ran in Southern Accents magazine(R.I.P. SA, sniff, sniff). It is a lovely picture and I remember calling and asking what the floors were a few years back. They were an antique oak and just lovely in the ad. I called and after asking one too many questions, was transferred to “Bill” to “help” me. He got on the phone and asked me where the house is and I told him in Duluth, near the Forum and Wesleyan and I asked did he know where that is. He replied that he did and he continued with telling me his daughter, Irleand, goes to Wesleyan! OMG! Our kids go to Wesleyan! I knew this was going to be good. 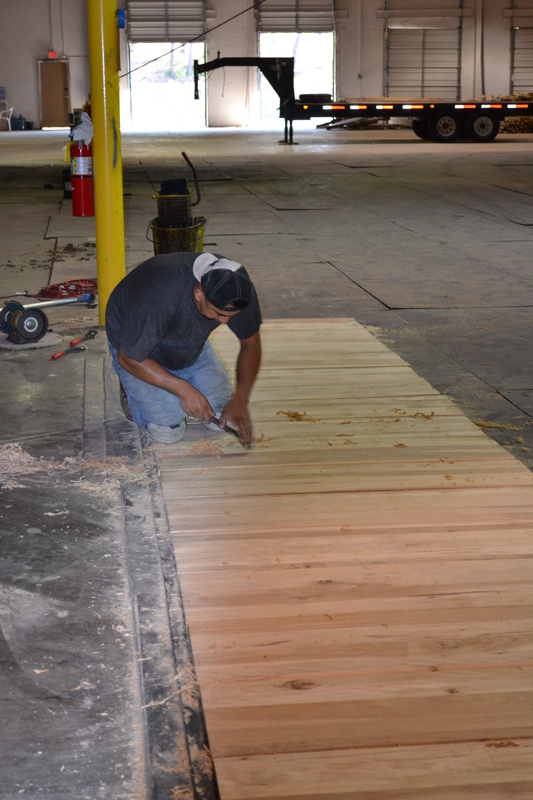 I told Bill about the house and he encouraged David and I to come to the warehouse and he could show us what they can do with hardwood floors. He also explained to me that they do not use polyurethane on their floors, never have, and that explained why I kept seeing floors that were of the right species but didn’t look like the one in the ad. They either use wax or tung oil on their floors to finish them. Now, it started to make sense why we couldn’t figure out why the samples from our builder did not match the one we had seen at an Interior Design shop. Well, today we finally got to go see Bill and his flooring and it was a really fun experience. He took us around and showed us different flooring- walnut is their most popular choice and the floor that we are going to use, hickory. It comes to him from Kentucky. We are going to go with a random width floor and the basic will be 3, 4 and 5 inch but many times, it comes in with widths up to 10 inches and ‘you get what you get’ as Audrey would say. 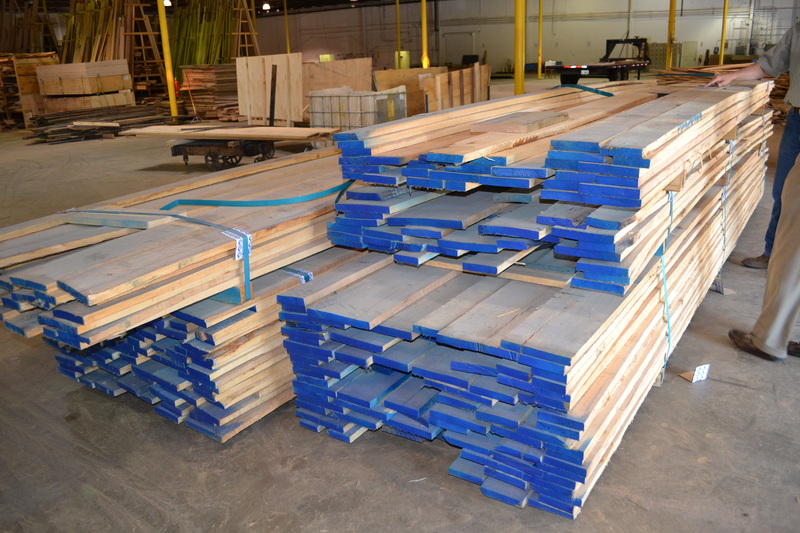 These are actually hickory stair treads that are headed to Florida. You can see how long this process would take! 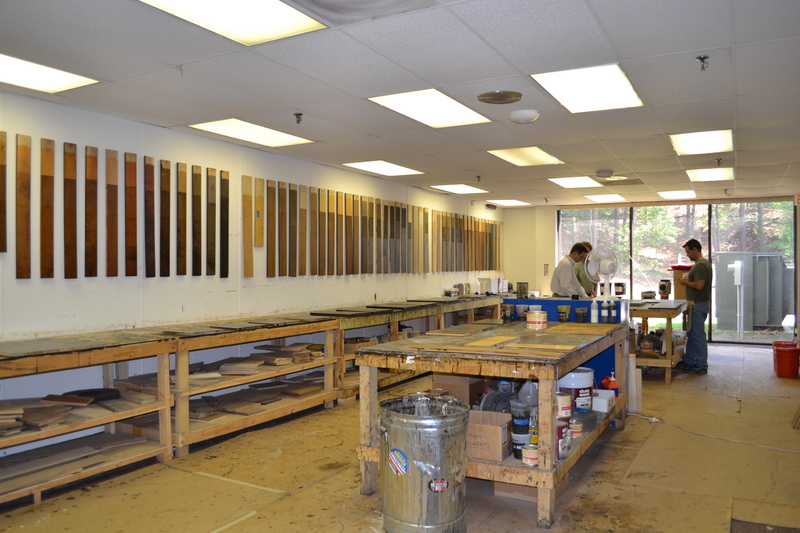 Then, there is the custom stain room. If you have a color or picture or specific color in mind, these guys can make it happen. Above, is the sample board that we liked. They are going to make up a couple of sample boards and we will go from there!